The 2019 Silverado LT Trailboss -- one of eight 2019 Silverado models planned. It was unwrapped Saturday at the Texas Motor Speedway. 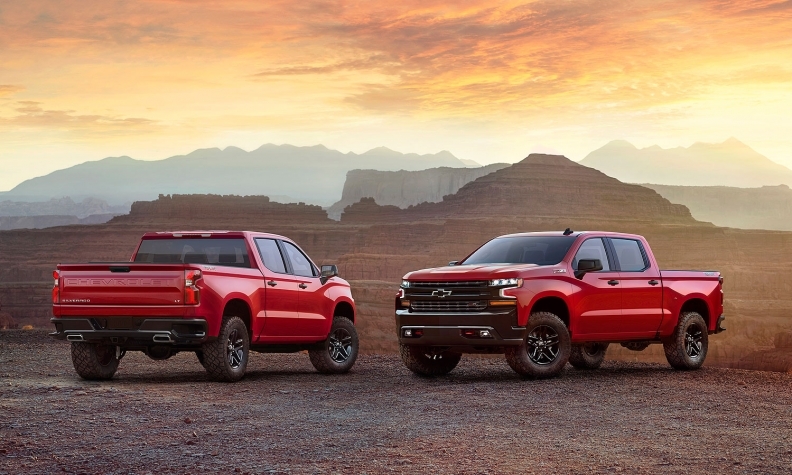 FORT WORTH, Texas -- The Chevrolet Silverado, GM's top-selling and most profitable nameplate, will be sleeker, more aerodynamic and available in more trim lines, with expanded powertrain options and functionality, for the 2019 model year. 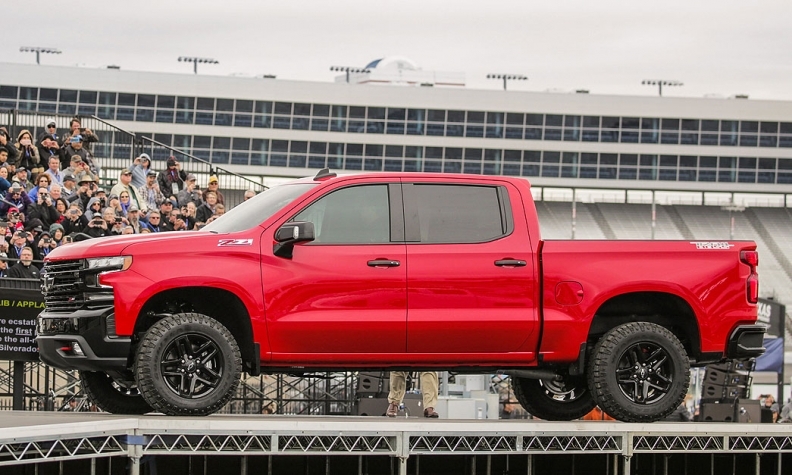 Chevrolet introduced the 2019 Silverado LT Trailboss, one of eight 2019 Silverado models planned, at the Texas Motor Speedway on Saturday before hundreds of Silverado owners as part of celebrations to mark 100 years of truck output. "The next-generation Silverado is poised to change, really change, the face of trucks again," said Alan Batey, president of GM's North America operations. "It’s strong. It’s modern. But it’s instantly recognizable as a Chevy truck." General Motors is adopting more light-weight materials, is expected to add a 10-speed automatic transmission and enhancing aerodynamics to improve the fuel-economy and overall competitiveness of the pickup. 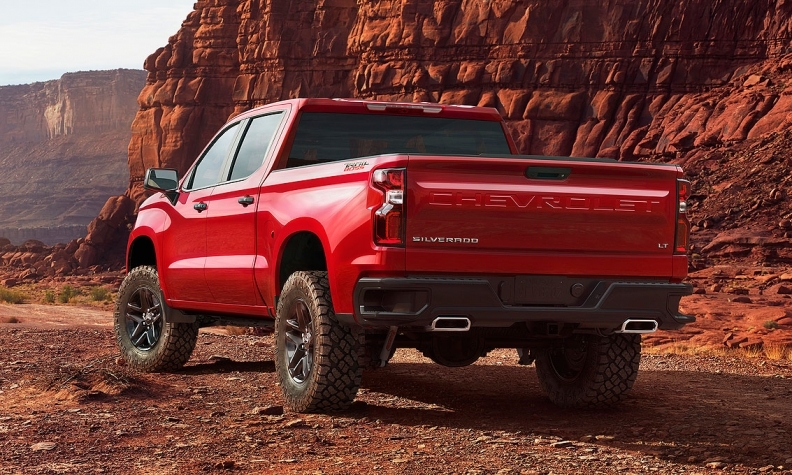 The redesign and re-engineering of the next Silverado and its GMC counterpart, the Sierra, are the biggest product program ever undertaken by GM, analysts say. GM is spending nearly US$3 billion alone to upgrade factories in Michigan, Indiana and Mexico to build the next Silverado and Sierra. Batey said the redesigned Silverado will offer more engine/transmission combinations, and additional technology and convenience features; however he did not disclose any other details. “We are truly committed to building a truck for every customer,” Batey said. Additional information is expected to be released when the Silverado makes its formal public debut at the Detroit auto show next month. The sleeker, yet aggressive, exterior on the fourth-generation Silverado is noticeably different than the more upright outgoing version. The cab has a slight slope in the roofline similar to GM's current midsize pickups, likely to aid aerodynamics and fuel economy. The rectangular grille on the truck features two large horizontal bars compared with one on the current-generation pickup that run into headlamp stacks that include prominent outward-boomerang daytime running lights. Chevrolet did not specify how much steel and aluminum is used on the latest truck; however it's expected to be a mix of both and other light-weight components as part of GM's strategy of using "the right materials in the right place." GM said changes in engineering and materials will result in "a significant reduction in total weight" on the pickup. The 2018 model has a curb weight between roughly 4,700 and 5,300 pounds (2,132 and 2,404 kilograms), depending on the configuration. The company is also expected to eventually offer a pickup bed that utilizes carbon fibre. As in recent years, General Motors aims to differentiate the Chevrolet Silverado from the GMC Sierra. Based on previous spy photos, both have unique front fascias. But the bodies mostly appear the same with slight differences in the rear. The Trailboss trim integrates the off-road equipment of the Z71 package as well as a two-inch suspension lift. Unlike aftermarket lift kits, the Trailboss suspension is fully tested, validated and warrantied by Chevrolet. Eric Stanczak, GM's chief engineer for full-size trucks, said the improvements to the next-generation pickups are based on recommendations and feedback from owners. "We spend a ton of time listening to our customers, doing market research and taking that feedback and rolling it into the vehicle," he told Automotive News on Friday prior to the unveiling. "If we are limited in terms of what we can update on the current architecture, we're almost always putting those new features the customer's asked for, or that new capability, or that improvement, into the next-generation." The redesigned Silverado kicks off what is expected to be a renewed battle for pickup buyers starting next year. But in Canada, sales of both trucks are up. Sierra sales are up 20.1 per cent to 58,071 units and Silverado sales are up 30.2 per cent to 55,306 units. Year-to-date light truck sales were 1.31 million through Nov. 30 in Canada, a 9.1 per cent increase from last year, while passenger car sales were 607,000, 2.8 per cent below last year. Fiat Chrysler Automobiles is slated to unveil the next-generation Ram 1500 next month at the Detroit auto show. FCA will begin selling the retooled Ram in the first quarter next year and GM will begin building the 2019 Silverado in the fourth quarter of 2018. Both companies have strived to reduce weight, boost fuel economy and enhance the functionality of their pickups to better compete against Ford Motor Co.'s F-150, the top-selling vehicle and large truck in the U.S. The Silverado is America’s No. 2 selling vehicle, ahead of Fiat Chrysler's Ram pickup, at No. 3. But, when it comes to pickups in Canada, the Ram and Ford F-series far outsell the Silverado and Sierra. Ford shifted its F-series pickups, including the full-size F-150, to lightweight aluminum alloy bodies starting in 2014. The F-150's styling and features were updated this year, and Ford plans to introduce a gasoline-electric hybrid variant in 2020. A long-awaited milestone -- an EPA rating of 30 mpg (7.84 litres per 100 kilometres in Canada) in highway driving -- could be hit next year with the latest pickups. Some analysts speculated Ford would achieve the feat with its change to aluminum, however, the 2018 F-150 achieves up to 26 mpg (9.04 l/100 km) in highway driving with a 2.7-litre V-6 EcoBoost engine and 10-speed automatic transmission. The 2018 Ram 1500 with a 3.0-litre V-6 diesel engine achieves up to 29 mpg (8.1 l/100 km) with an aerodynamics package, while the Ram's 3.6-litre V-6 engine is rated at 25 mpg (9.4 l/100 km) highway. Both Ram models come standard with an automatic eight-speed automatic transmission. The 2018 Silverado is rated at 24 mpg (9.8 l/100 km) highway with a 4.3-litre V-6 and eight-speed automatic transmission. Saturday's surprise unveiling, which some expected to occur at the Detroit auto show, came nearly five years to the day when GM unveiled the current-generation Silverado and Sierra for the 2014 model year in Pontiac, Mich.
About 1,000 people, including 450 or more current truck owners, were expected to attend Saturday's centennial celebration event.